The Nodaway News Leader has been dedicated to presenting local and area news for Nodaway County readers. Our staff is both experienced and knowledgeable in the production of a dynamic form of news services to best engage and inform our loyal readers. Being still a youngster in the newspaper field, the Nodaway News Leader staff has been printing a weekly encapsulated news product since 1996. Our news focus continues to primarily be county government and elementary/secondary education. The NNL is also proud to be producing this active website filled with a taste of our local newspaper. 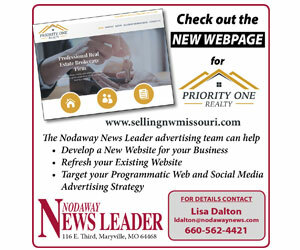 Nodawaynews.com allows readers who are away from their post office-delivered edition to keep up on the events of the area. Staying current with media trends, while offering a down-to-earth view of the events that shape the lives of the people of Nodaway County, reinforces the commitment level of the staff of the Nodaway News Leader.